A neat little dock that unlocks a whole new world from your Samsung phone. Limited, yes, but if you're already into Chromebooks then the experience won't be that different. Samsung DeX, the brand’s dock to turn your phone into a PC environment has been rebooted, to encourage more people to do more things with their new Galaxy S9. The big change here is to the design: the phone will slide onto a pad and onto a USB-Type C connecting, thrusting you into the PC-like environment that lives secretly within your phone. Simply connect up a keyboard, mouse and monitor and you're away. It brings with it the ability to use the phone as a touchpad and a keyboard, and will offer backwards compatibility to the Galaxy S8, S8 Plus and the Note 8. But beyond a new design, what’s really changed? The Samsung DeX Pad has been retooled from the hockey puck-style dock that would flip open and let you slot the phone in to something that exposes the screen of your handset a lot more. This is by design - instead of the phone being locked away, you can now use it as a touchpad (providing you haven’t plugged a mouse into one of the two USB ports on the back. In terms of ports, there’s also an HDMI-out connector, as well as a USB Type-C connector. However, one thing that has gone is the ethernet port, presumably as Samsung figured Wi-Fi to be so ubiquitous that it was an unnecessary design extra. Thanks to the change, the dock is also much lighter at 135g, meaning if you’re carting it around in your bag ready to hotdesk it’s not going to be as cumbersome. 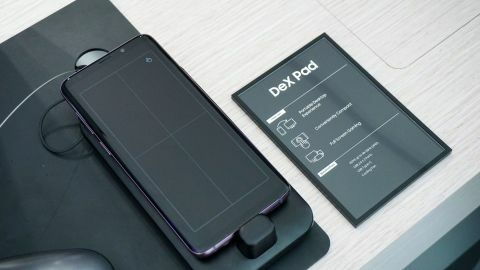 Despite the reduction in weight, the new DeX Pad still has a cooling fan that keeps the phone cool during operation, as despite charging it can still get pretty hot with the processing power needed. Plugging in the Samsung Galaxy S9 Plus in our demo was a little tough - the USB-C connector seems to sit a little high so the phone dangled and was a bit loose on the dock, but there was also a security tag on there slightly getting in the way, so we won’t pass judgement on that just yet. It's also got a little extra height in case you're one of the many people using a case on your fancy new phone - it's a helpful little extra. In addition to being used for the Galaxy S9 and S9 Plus, as mentioned, the DeX Pad will also be backwards compatible with the Galaxy S8 pair and the Galaxy Note 8 too - but not quite yet. The whole point of DeX is that it offers a new working environment from your phone, allowing you to do word processing, PowerPoint, spreadsheet work, gaming and use myriad Android apps too. It’s an impressive set up when it loads for the first time, although you’ll need to wait for a few seconds when connecting the phone to the USB Type-C clip at the bottom of the dock. Once in, you’re treated to a very familiar interface if you’ve used Windows of late - the windows resize in a very similar fashion, the dock has icons that you’ll instinctively know how to use and while the icons on the right-hand side are a little confusing, you’ll work it out pretty easily. On top of that, you’ve got full access to your Samsung Galaxy handset within a virtual window, allowing you to reply to messages or open the apps your normally would on your device. We were able to open a Google Doc pretty quickly, simply by downloading the app, and instantly we were able to access all of our normal files and word processing options, typing out a quick doc and having it automatically save to the cloud. One of the smaller misses on the DeX pad is the apps - there aren’t that many coded definitively to work on the larger screen from the phone, meaning you might not always get the best experience. We tried Adobe Lightroom to manipulate images, and the basics of changing color balance and lightening images wasn’t too bad - and with a mouse the process was pretty rapid. It's not fully-featured and this is definitely more of a ‘if there’s no other way’ option, as in it’s good to have, but you wouldn’t choose it over standard desktop software. Some of the gaming experiences weren’t that great either, with Brutal Street 2 (a recommended game) not very easily to manipulate using the phone as a touchpad. Other games were slow and laggy when put into full-screen - perhaps they weren’t optimized, but again it showed that the DeX isn’t really a gaming machine for those titles that work best on the smaller display. Using your Galaxy phone as a touchpad is a, well, fine experience with DeX. It’s not as good as using an actual mouse, and when you plug one of these in, the experience will always choose the peripheral. However, it’s perfectly possible to use your phone as a touchpad, with two-finger gestures enabled, double-tapping possible and a smooth feeling as you glide your finger across. You will run out of range a little easily it seems (perhaps there are some settings we can dig into a little better in our review) so you’ll need to do a lot of swiping… and the ability to click it is obviously lost, but haptic vibrations would have helped out a lot here. Annoyingly we couldn’t try using the Samsung Galaxy S9 Plus as a keyboard, as this feature isn’t enabled just yet - it’s always a shame when a brand doesn’t have the full set of options available at launch, and that’s the case here again. It’s hard not to be impressed by having a secret Chromebook hidden in your phone. Providing you have a monitor ready to go (and ideally a keyboard, as using the mouse to peck out letters using an on-screen keyboard is a nightmare) then you’re instantly set up ready to go. If your business is set up for a Google Suite or Microsoft’s productivity apps (which are installed from the outset) then you can instantly be working within a minute of sitting down with a phone. We’re still waiting for a DeX price, but we expect it to be less than $150 / £130 / AU$200 - not the most expensive, but you’ll need to find a lot of use for the functionality to really make it worthwhile.